Most people have a few cookbooks, some of which get used a couple of times, providing the odd dish or two before being left on the shelf and forgotten, others of which are used over and over again for years, decades, gradually acquiring a coat of flour, grease, stains, spills. Battered books that work hard. Larousse Gastronomique is one such volume. Larousse Gastronomique was first published in 1938, edited by the inimitable Prosper Montaigne, with a preface by Auguste Escoffier. Between them, these two men shaped modern French cuisine and gastronomy. Escoffier reinvented the way in which a professional kitchen worked, introducing the brigade concept, and improving the career of a chef from that of a journeying tradesman to a skilled professional. His achievement was to reinvigorate traditional French cuisine and bring it to a new audience, whilst also inventing Melba toast and rescuing the grand dining room of the London Savoy for good measure. Montaigne built on this foundation, clearly using Escoffier’s Le Guide Culinier as the basis for his own Larousse Gastronomique, a fact that both irked and flattered Escoffier. Montaigne chronicled the intricacies of French cookery, demystifying the secret codes and techniques, recording everything with deep insight and the sharp eye that only a Frenchman could really master. Or, to put it another way, the British are backwards, uncultured, uncouth and beyond hope. Montaigne throws us crumbs of comfort, encouragement, even, noting that we continue to develop our taste for wine, surprisingly praising English cheeses and flatly noting a love of chips, to which he adds that “there are special fish and chip shops where they are sold”, as if this were the most ridiculous fact ever committed to paper. Montaigne’s mildly amusing opinions of the British divert from the scope and influence of his work. 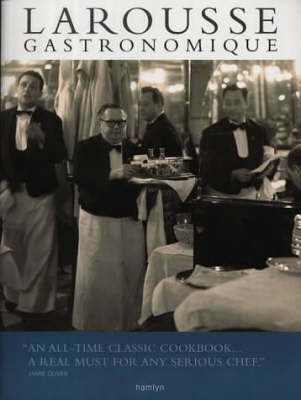 Larousse Gastronomique is a titanic book, an encyclopedic view of French cuisine, as useful and relevant now as it was in 1938. Here is a book that deserves a berth on any kitchen bookshelf, preferably next to something by Elizabeth David. Larousse Gastronomique is endlessly interesting, entertaining and informative, a true modern classic.